Fireplaces and televisions are stapled elements in our living rooms. One provides us with entertainment, the other ensures we feel warm and comfortable. The problem? Both are competing focal points. If you don’t get the right TV and fireplace arrangement for your living room, you will wind up confused when the two are in use. One of them will appear like an eyesore. To avoid duelling focal points, find a pleasing arrangement that works for your living room. Here are our suggestions (and a few photos to prove our point!). The best way to deal with two strong focal points is to separate them. Place the tv and the fireplace on an angled wall. This way, you will enjoy them better at the same time. 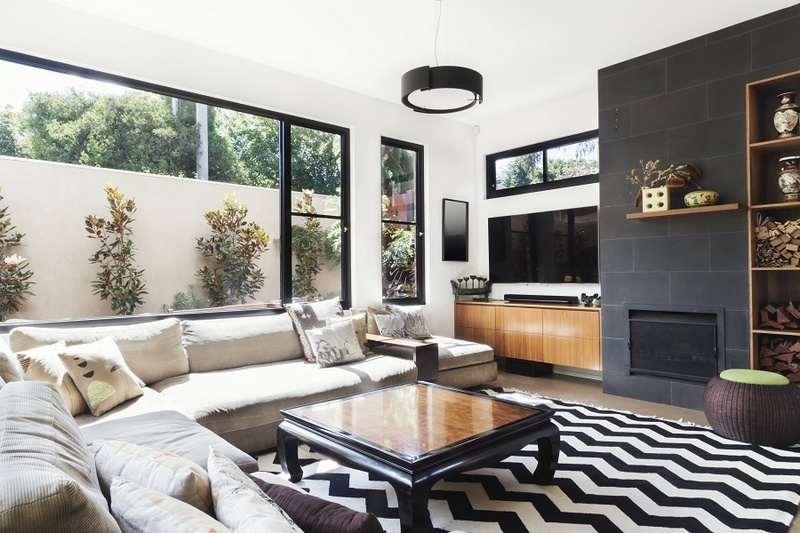 Separating the television and fireplace in the same room is difficult to get right, but done correctly in these homes. Have enough need negative space in between the two. Also, plan the furniture you will use. Make sure that you and your guests can see both the fireplace and the television. In this apartment, the designers stacked the television and the fireplace. The two look united because they have the same size and are both built into the white wall. Mind the height whenever you put the TV above the fireplace. Don’t go too high or else you’ll strain your neck. Connect the TV and the fireplace when you place them in a joinery. Both offset one another for balance. If you’re planning to customise the surrounding of the fireplace and TV, consider a design that offers extra storage. This design is foolproof. When you put the TV in an alcove, you create a harmonious relationship between the two. We like it when the hearth of the fireplace is smaller and lower than the TV. This keeps the fireplace from overpowering the TV when it’s on. Contrasting backgrounds will separate the TV and the fireplace on the same wall. Darker colours and intense textures as the background of one living room component will highlight it. Here, more attention is given to the fireplace. The brown wall cladding intensifies the warmth of the fire. On the other hand, the TV on a crisp white background does its own uninterrupted business on the side. Let's design your dream living room.